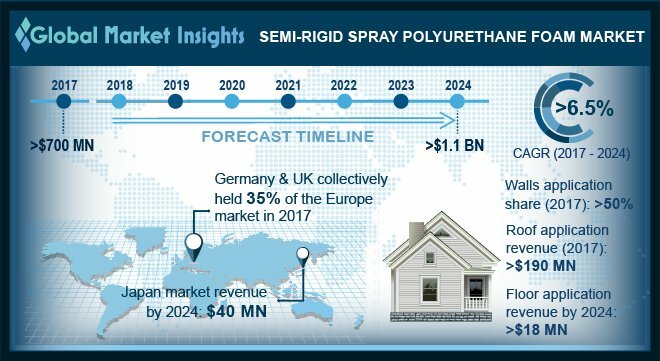 Semi-Rigid Spray Polyurethane Foam Market size will surpass USD 1.1 billion by 2024; according to a new research report by Global Market Insights, Inc.
Overheating of attics in the summers is a growing concern in the European countries due to the climate changes. Extensive insulation used in maintaining the indoor temperature, energy saving and storing heat in panels will escalate the semi-rigid SPF market growth in this region. Building and construction accounts for over 40% of the total energy consumption in Europe. According to UN Summit, energy conservation is the major challenge and Europe plays a pivotal role in this scenario. Increasing energy efficiency are the basic criteria for closing the gap between energy consumption and rising power demand. European Union has taken numerous measures such as energy efficient renovations for government properties, mandatory energy efficient certificates for residential and industrial buildings. This will drive the product market growth in next seven years down the line. Some of the key semi-rigid SPF market players include Honeywell, Lapolla Industries, JJD Urethane Co, NCFI Polyurethanes, The Dow Chemical Company, and Foam Supplies Inc.